Differentiation in plants refers to the processes by which distinct cell types arise from precursor cells and become different from each other. Plants have about a dozen basic cell types that are required for everyday functioning and survival. Additional cell types are required for sexual reproduction. While the basic diversity of plant cell types is low compared to animals, these cells are strikingly different. For example, some cells such as parenchyma cells retain the potential to respond to environmental and/or hormonal signals throughout their life and, under the right conditions, can be transformed into another cell type (transdifferentiation). Other cells such as the water-conducting vessel elements undergo cell death as part of their differentiation pathway and thus can never transdifferentiate to another cell type. Despite the differences among mature cells, all are ultimately derived from the apical meristems , populations of embryonic cells at the tips of the shoots and roots. Meristem cells are uniform in appearance: they are small and cuboidal in shape, and have a thin, flexible cell wall, a high nucleus to cytoplasm ratio, and dense cytoplasm with numerous ribosomes . The first step in the differentiation pathway is the formation of the precursors of the three tissue systems: protoderm (dermal tissue system), ground meristem (ground tissue system), and procambium (vascular tissue system). Each of the three tissue systems is found in a predictable location and consists of one or more multicellular tissues that carry out a unique function. For instance, the dermal tissue system is found at the surface of the plant and consists of a single tissue type, the epidermis. The epidermis functions to protect the plant from water loss, to permit gas exchange, and to provide a barrier to the invasion of harmful fungi and other microorganisms. The ground tissue system occurs internally to dermal tissue and may consist of three tissue types: parenchyma tissue, collenchyma tissue, and sclerenchyma tissue. Parenchyma tissue is a multipurpose tissue that functions in photosynthesis and storage, while both collenchyma and sclerenchyma function to support the aboveground parts of the plant against the pull of gravity. The vascular tissue system occurs at the center of roots, stems, and leaves and functions in the long-distance transport of water and solutes . It consists of two tissues: xylem tissue and phloem tissue. Xylem provides a conduit for the movement of water and dissolved mineral elements from the roots to the shoot system. In contrast, phloem transports an aqueous solution of the products of photosynthesis from the green photosynthetic shoots to the roots and other parts of the plant that are using or storing food energy. Epidermal Cell Types. Epidermal cells are the most common cell type in the epidermis. These cells are often called "pavement cells" because they are flat polygonal cells that form a continuous layer, with no spaces between individual cells. Epidermal cells secrete the waxy hydrophobic substance cutin that polymerizes on the surface, forming a barrier to water evaporation. Epidermal cells are transparent because their plastids remain small and undifferentiated; hence light readily penetrates through to the photosynthetic tissues beneath the epidermis. Two more specialized cell types are also found in the epidermis: guard cells and trichomes. Guard cells are kidney-shaped cells that are filled with chloroplasts. They always occur in pairs and form a small pore between them. The pair of guard cells and their pore is called a stomate and functions in gas exchange. Typically, the guard cells open the pore during daylight hours to allow CO 2 to diffuse into the photosynthetic tissues below. At night, however, the guard cells close the pore, preventing the diffusion of water vapor from internal tissues. The green chloroplasts of the guard cells function to provide the energy that fuels the opening and closing process. Trichomes are long, narrow epidermal cells that grow perpendicular to the surface. Trichomes are either unicellular or multicellular and come in an amazing array of shapes. Some are branched and some are shield- or umbrella-shaped. Trichomes form a hairlike covering on the surface of leaves, stems, and roots and perform several important functions. The simple, unbranched trichomes of roots are called root hairs and function in the absorption of water from the soil. Trichomes on the surface of leaves and stems function primarily to retain water vapour and reduce the evaporative loss of water. Some trichomes secrete defense compounds that repel insect herbivores. Figure 1. Distinct plant cell types are all ultimately derived from apical meristems. sweet fruits such as apples), organic acids (as in oranges), or defense compounds such as the tannins found in tea leaves. Other specialized parenchyma cells may have starch-containing plastids such as those of potato tubers. Collenchyma cells are long narrow cells with thick, strong, yet extensible, cell walls. Collenchyma cells are found in strands or sheets beneath the epidermis and function to provide support while a stem or leaf is still expanding. When growth is complete, sclerenchyma cells take over the role of providing mechanical support. Typical sclerenchyma cells are also long narrow cells (called fibers) with thick strong walls. Unlike collenchyma, the cell walls of sclerenchyma fibers are hard and rigid due to the deposition of lignin within the wall. Fibers contribute more than half the volume of woody tissues and are found in all stems and leaves that are hard and tough. Other specialized sclerenchyma cells are shorter (sclereids) and have a protective function such as those of seed coats, walnut shells, or peach pits. Since the supportive or protective functions of sclerenchyma are carried out by the lignified cell walls, there is no requirement for living cytoplasm and these cells typically die as part of the differentiation process. Vascular Tissue Cell Types. The vascular tissues are complex tissues, each consisting of a number of distinct cell types. The xylem contains conducting cells called vessel elements, as well as sclerenchyma fibers and parenchyma cells. Vessel elements are highly specialized cells. Like sclerenchyma fibers, they form a thick cell wall that is impregnated with lignin. This cell wall can take many forms, depending on the time and location of its formation within the plant. In tissues that are growing, the lignified part of the cell wall is formed in rings or a helix, allowing the vessel elements to extend as the plant grows. In nonexpanding parts of the plant the cell wall forms as a netlike or pitted structure; these patterns contribute to the mechanical support of the plant and prevent cell collapse. Vessel elements are aligned end to end within the xylem. The part of the cell wall between adjacent cells is degraded, so that the interior of all the vessel elements in a file becomes continuous, forming a vessel. Vessel elements are dead at maturity, leaving a hollow tube for the flow of water upward from the roots to the shoot system. 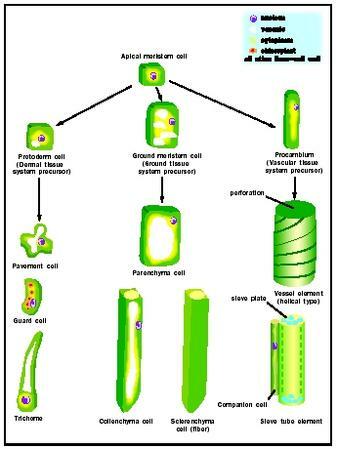 Phloem is also a complex tissue, containing two unique cell types, the sieve tube elements and companion cells, as well as parenchyma and sclerenchyma cells. Sieve tube elements are elongate cells with thick flexible cell walls. Adjacent cells are aligned end to end, forming the sieve tube. The end walls between adjacent cells have numerous pores; the sievelike appearance of these end walls led early microscopists to give these cells their name. Sieve tubes transport the products of photosynthesis from the leaves to all parts of the plant where energy is needed or stored. The mechanism of transport requires that the sieve tube elements have a living cell membrane, but not other large components of the protoplast that might block the pores on the sieve plate. Thus mature sieve tube elements lack a vacuole, a nucleus, rough endoplasmic reticulum , and golgi. Sieve tube elements often live for years, but only because each is associated with a specialized parenchyma cell called a companion cell. The nucleus and cytoplasm of the companion cell must do the work for two cells, making and exporting the proteins required for sieve tube element function. three trichome branches. When the trichome cell has reached its full size and shape, it adds thickness to its cell wall and deposits sharp crystals of calcium oxalate on the surface of the trichome, adding to its effectiveness in defense against herbivores (see Figure 2). Vessel Elements. Vessel elements differentiate from cells of the procambium. Vessel elements are first differentiated from other procambial cells because they expand more than their neighbors. Vessel element precursors next begin to deposit the thickened, lignified parts of their cell walls in either the ringlike, helical, netlike, or pitted pattern. The pattern can be predicted by the location of elements of the cytoskeleton within the cytoplasm that help guide wall precursor to the proper location. When cell wall synthesis is complete, special wall-degrading enzymes attack the end walls of the cell, forming the perforation between adjacent elements in a vessel. Finally, the vessel elements undergo programmed cell death. The cell makes protease enzymes and nuclease enzymes that reduce proteins and nucleic acids to their simple building blocks. Surrounding parenchyma cells absorb these small molecules, leaving an empty vessel (see Figure 3). Figure 3. Vessel element differentiation. are expressed exclusively in the mesophyll cells, whereas the genes encoding the enzymes of the C3 pathway are expressed only in the bundle sheath cells (see Figure 4). 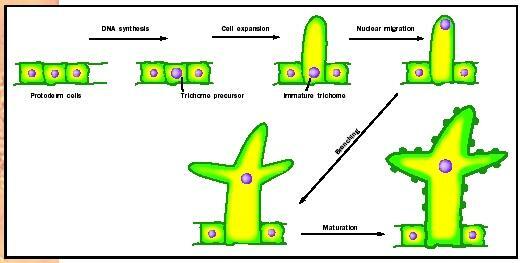 Cell differentiation is only part of the larger picture of plant development. As plant organs develop (the process of organogenesis), the precursors of the tissue systems form in response to positional signals. Then, within each tissue system precursor, cell types must be specified in the proper spatial pattern. For instance, the spacing of trichomes and stomates within the protoderm must be specified before their precursor cells begin differentiation. Exchange of signals among neighboring cells is an important aspect of the processes of spatial patterning and cell differentiation. In addition, long distance signals are required so that the strands of xylem and phloem cells within the leaf vascular bundles connect perfectly with those in the stem. Many aspects of differentiation are controlled by hormones . The hormone auxin, for example, plays an important role in the differentiation of vessel elements, both in intact and wounded plants. This role was first demonstrated in experiments where small incisions were made in stem internodes that cut though the phloem and xylem of a single vascular bundle. Auxin produced by the apical meristem and young leaves above the wound induces parenchyma cells to regenerate the damaged vascular tissue. Parenchyma cells undergo transdifferentiation. Although they already had differentiated as parenchyma cells from ground meristem precursors, they now repeat the steps that procambial cells take when they differentiate as vessel elements. Cells are induced to do this in a chainlike pattern, so that a new continuous strand of vascular tissue is formed as a detour around the original incision. Scientists know that auxin is involved, since transdifferentiation is blocked when the sources of natural auxin (young leaves and buds) are removed or when auxin transport inhibitors are applied. If natural sources of auxin are removed, and artificial sources added, transdifferentiation of parenchyma cells will occur, regenerating the vascular bundle. Howell, S. H. Molecular Genetics of Plant Development. New York: Cambridge University Press, 1998. Lyndon, R. F. Plant Development: The Cellular Basis. London: Unwin-Hyman, 1990. Raven, Peter H., Ray F. Evert, and Susan E. Eichhorn. Biology of Plants. New York: W. H. Freeman and Company, 1999. Figure 4. Bundle sheath cell differentiation. what is the difference between sieve plate and pitted wall of parenchyma cell?